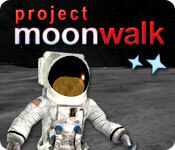 Project Moonwalk is rated 2.9 out of 5 by 10. Rated 5 out of 5 by lilTweet7 from :) Enjoyed the demo, even though I only played a few minutes of it, and decided to purchase it with a game credit. The graphics are great... some realistic, and some graphic art mixed in. I love anything to do with science and astronomy. Though not a difficult game at all, I love the theme, and because it installed fine (and fast), nor did I have any glitches detected during demo play, I thought, what the heck. Would be wonderful to see more of these type games (science, real or sci), on a greater sophistication and challenge level to be made in the future. Rated 5 out of 5 by tailswhiskers from A good game if you want to become an Astronaut I am still playing the demo. I am in the simulator for the h g's. It is a good game to see what an astronaut has to go throught to become an astronaut. I like anything to do with space and I like the game very much. I would recommend this game if you want to see what an astronaut has to go through or if you want to become an astronaut. Rated 3 out of 5 by catbag8717 from Sci-Fi Nerds Will Love This! Since there were no reviews, I thought I would give this game a spin. I really enjoyed the trial, and I thought it was a unique game. 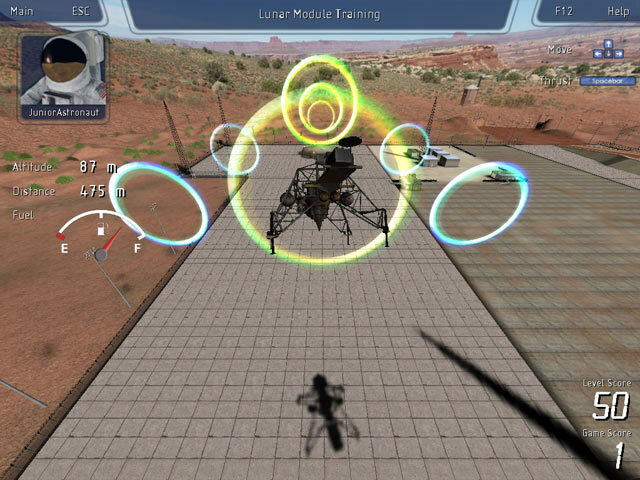 Project Moonwalk is a quiz game with a few puzzles (you have the option of skipping the puzzles) that guides you step-by-step through the “Space Race” between Russia (The Soviet Union) and the USA from the early 1950s to late 1960s, and is rather enjoyable. The quiz questions are fairly easy (for example: Who owns the moon?) and include some questions with more than one correct answer, so there isn’t much of a challenge there. What adds to the challenge though are the puzzles, which included the centrifuge training (which was actually quite fun) and launching a rocket in to space (not fun for me). The graphics in my opinion were superb. They were top-class, and very clear. The artwork was excellent. The demo though is a laughable 19 minutes (maybe even shorter, since I went back in thinking I had gone back to the menu by mistake), so you would have to have really enjoyed it to purchase it. While I won’t be buying this game, I really did enjoy the trial. It was fun while it lasted, so I would definitely recommend this game. Rated 2 out of 5 by pennmom36 from STEP ASIDE NEIL... 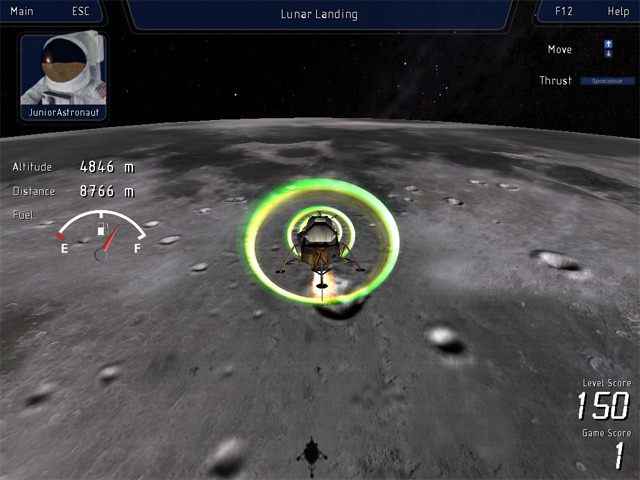 If you like rockets or simulator type games then this is the game you've been waiting for. 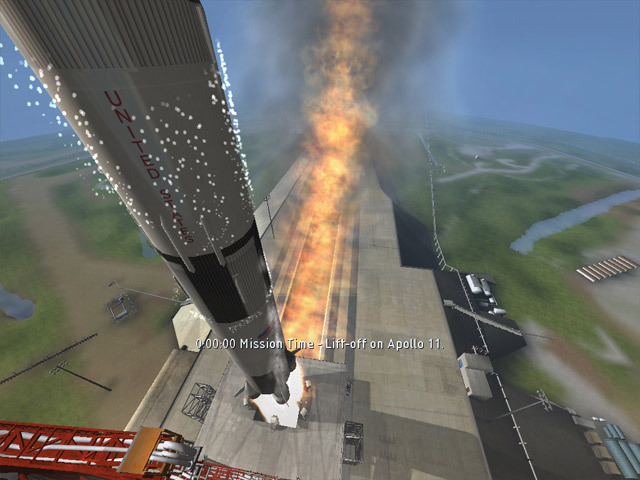 I will say that I played the demo selection and you have to answer several space related questions that I thought was very educational as well as the fact that in the beginning they explain all about the first satellite launch and talk about JFK's race for space. The game itself was too slow paced and you had to use the keyboard for walking and during simulations and that's too old fashioned for my taste. I think this game might be too hard for younger kids and older kids and adults will become bored quickly. Rated 2 out of 5 by Pearly11 from Was this found in some old archive? Based on trial which only lasts about 10 minutes. Difficult where to start. You get informed about the history of man in space, starting with the launch of the first Soviet rocket. You have to answer questions correctly to advance in the game. You have to do test, such as launching a rocket and finding out the rate in which the fuel gets burned to get it into space. In the first attempt you get a rough idea whether you need to burn fuel faster or slower and eventually your rocket will enter space. After that I wound up in a centrifuge and here you have to do a keyboard test (type in the letters you see). That's it. That's the trial finished. Apart from these two actions all the game was filled with was a view of planet Earth form space which looked really cool and a speech on an ancient TV Set by JFK. The game feels a bit as if it was made about 20 years ago and boosted up with better graphics. I found the trial didn't give me enough inside into whether I would like the game or not. It was over after a less than 10 minutes. So I decided not to buy it based of what little I have experience during the trial. It may be really good and I'm looking forward to reading a review of somebody who completed it. To buy this would be a dare and I just don't feel so daring right now. Rated 1 out of 5 by CelticCoco from Very Retro, Very Dull Game This is not a game for adults, gamers, science buffs, or anyone who has involvement with space. Unfortunately this game isn't even bad enough to be funny - it's just dull. The demo lasted me 16 minutes, including a replayed level - not enough time to really evaluate a game, but after playing the demo I wasn't interested enough to pay money for the rest. Very slow, not enough actual playing time, flat graphics - especially for 3D. I do not recommend this at all. Not even as a daily deal. Rated 1 out of 5 by kleptonat from In no way was that 'fun' Slow uninteresting unskippable animation from the 90's interspersed with multiple choice questions. Rated 1 out of 5 by Geanois from Really disappointing I only played the demo which is extremely short but full of boredom. Although the description gave high expectation of lots of fun this game wasn't able to keep the promises. In fact most of the time you are watching some cutscenes, the "gameplay" is to click some buttons from time to time or answer some questions. Sadly I found nothing more I could write about, so all I can say is that this game is a total fail. I wouldn't recommend this game to anyone.